-Realtime software. Must use parallel port to drive the stepper motor driver. -No USB or Ethernet available yet. -Most flexible. Feedback can go right back to EMC. -Lack of motion controller may result in unacceptable cuts. -Mesa Electronics - 5I25 Anything I/O FPGA card connects to the PCI slot in the computer. Card has a parallel port output with individually programmable direction and function. Parallel port can then be connected to the MESA breakout card. 7I74 - 7I85. Use the 7I85S to add encoder. Use the 7I84 that connects to the RS-422 serial port on the 7I85 card for limit switches. Software need a computer with parallel port to work. If you don't have a computer with parallel port, then you need a USB to parallel port. However, USB to parallel port may not be stable. Windows is not a real time operating system. The output of windows is not precisely timmed. What is more stable is a Motion Controller card for the computer. The motion controller gives the CNC machine precise timing pulse to run it. This USB Motion Card may work. Does not seem too robust. Purelogic from Russia has one too. Automation Technology USB Breakout Board - With a little more work. Kelinginc has some breakout box for cheap. also large selection of stepper motor. Breakout box takes input from the parallel port, and boot it's power. Normal parallel port cannot put out much power, and is easy to fry. Need to have a breakout box. Motion controller: SmoothStepper or KFlop - Has timming to interface with motor controller. Autodesk's Fusion 360-Is free, and has CAM in it. https://www.synthetos.com/project/tinyg/ - This can drive a 6 axis machine. Can drive a NEMA 23 stepper. May not have enough amp for holding power. Takes G-code from USB and interperet it to motion path. Use ChiliPeppr to run this. ChiliPeppr basically supplies the driver with G-code. 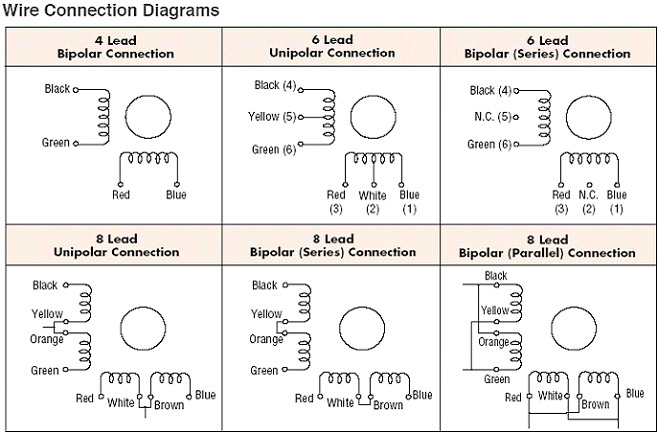 Bipolar and Unipolar: Bipolar means controller change polarity in the winding. Unipolar means controller does not change polarity. Bipolar motor has 2 winding / 4 leads. Unipolar has 2 windings and 6 leads. The 2 extra leads in the unipolar is the center tap for the winding. Ignore the 2 center wire on a unipolar motor to make it a bipolar motor. Half the rated current since resistance doubles, and heat generated will be doubled. Bipolar = more efficient use of motor size, more performance. CarrLane - Mini Grippers Use these instead of a large vice. See Youtube. littlemachineshop.com - Use the precision milling vice. Precision Toolmakers Vise from ebay. Yahoo group notes on ballscrew. 8mm x 2.5mm, 1.2mm ball w/ 20mm dia nut is too small. 10mm x 3mm s/b minimum. Risky with ER16 spindle. Kress spindle should be ok. 12mm ballscrew is best. What is the most popular CNC Controllers. 66% Mach 3, 25% LinusCNC (EMC3). Flashcut seem to do well with precision machining. Think is mainly the motion control board. CNCRouterParts.com Has some NEMA 23 motor, but 3/8" Shaft Size. Grizzly - G0704 has a large following. Easy to conver to CNC. Also know as BF20. Tom D. Walshaw AKA Tubal Cain - Suppose to have good metal working books.